Set in the Rice Fields but close to restaurants, a supermarket, spas, a yoga studio and transport. Wonderful full service breakfast included, (considered by many to be the Best in Bali) daily cleaning, air con and wifi. Stay in the most exciting area of Ubud. Close to all amenities. 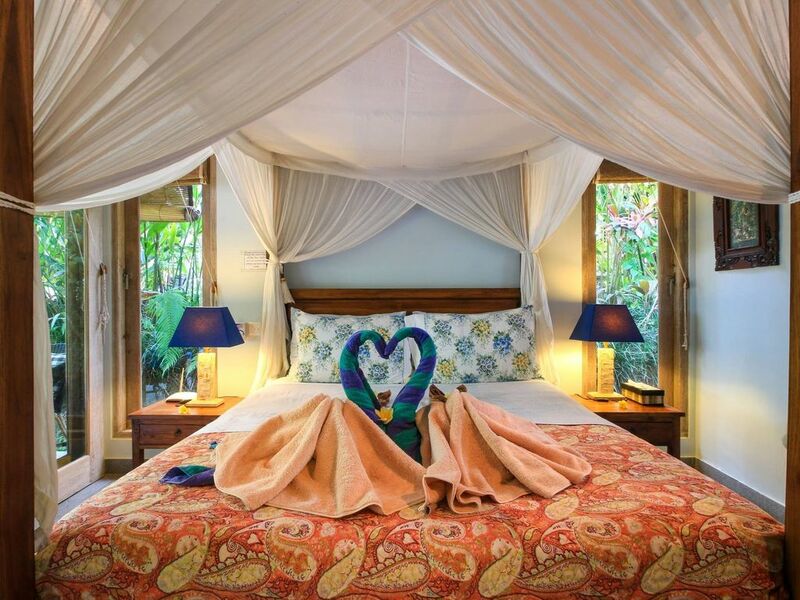 Bungalow Jepun is a jewel set in the center of a quiet lush garden filled with the sounds of falling water, exotic birds and the bark of geckos. A short walk along a narrow path about 200 meters from the main road takes you away from the sounds of cars and motorbikes and into the our compound . Villa Semua Suka, which means "everybody likes' and Bungalow Jepun are contained within the same walled compound and lush gardens . The outdoor veranda, swimming pool, gazebo and garden are all part of your living area. It was completed seven years ago to Western standards with a Balinese aesthetic, and was built on the lower level of a former rice field. It has a fish pond and small waterfall, its own garden, outdoor loungers, umbrella, a small veranda with a table and 2 chairs and another comfortable chair for relaxing. Bungalow Jepun also has air conditioning, a flat screen Tv and Dvd player, iPod player, and small daybed, as well as wireless internet throughout the grounds. Your stay at Bungalow Jepun includes a gourmet breakfast featuring our own house-made bread and jams, fresh fruit, choice of eggs, pancakes, and local specialties, plus great Balinese coffee! You'll be well taken care of by our staff Made’ Pia and Made’ Ratna. Made' can also help with arrangements for day trips, rafting, downhill biking, cooking classes, etc. Bungalow Jepun is set in the in a small community where ex-pats, and locals live side by side for . Less than a 5 minute walk down the path is an excellent Yoga studio, 6 small restaurants, a couple od Spas and a large supermarket. You have in Bungalow Jepun, the authenticity of the village of Penestanan and the yet the convenience of being just a 15 minute walk from the town of Ubud, where you can find many excellent restaurants, museums, galleries and shopping fun! Our guests have access to the swimming pool, garden grounds, a relaxing gazebo and the services of our staff. We are sometimes at home in Bali, and when we are....interact extensively with our guests who often become like members of our family. Milo our pug is here when we are to entertain our guests as well. The neighborhood is very convenient to everything in Ubud and is a microcosm of the best that Bali has to offer. A walk out to the rice fields will enable you to experience the daily life of the farmers in this agricultural community. Watch the ducks as they clean the rice fields and get them ready for a new crop; see locals washing their laundry in the streams; visit with local artisans in their homes and really get a sense of what Bali is all about! There are cars and drivers that can be rented along the main road for trips into Ubud. We also have a driver that can take you touring anywhere in Bali. Some of our guests have opted to rent motor bikes or push bikes and that's something that we're able to arrange on their behalf.